Signs. LJMDesign Provides Quality Printing, Signs and Websites. Cairns and Townsville North Queensland. LJMDesign provides quality sign products at great prices. 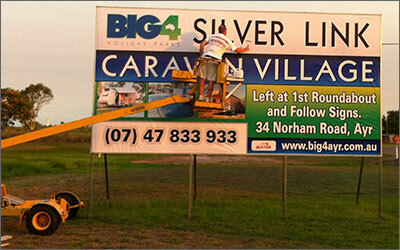 We combine good design with quality brand name materials ensuring your signs will look great and last many years in the North Queensland climate. Please browse the sign categories below to see what we can do, and do not hesitate to contact us wIth any questions. A-Frame signs are handy to put in and out every day to show your open for business! Corflute is a very hardy, light weight material, most commonly used for real estate signs. LJMDesign can make corflutes to almost any size or shape to suit your needs. Create a more professional interior with great signs. Options can include stand off signs, plastic perspex signs or even 3d routed signs. Saftey signs to allow your vehicle on any mine site. Class 1 reflective material, business logos, reflective safety strips and much more.